Governor Terry Sanford established the North Carolina Fund in 1963 with grants from the Ford Foundation and the state’s own Z. Smith Reynolds and Mary Reynolds Babcock Foundations. Over the next five years, the Fund operated as a unique, experimental antipoverty agency. It was, in fact, a model for President Lyndon Johnson’s national War on Poverty. The Fund had its origins in the stark contrast between widespread poverty and the affluence of post-World War II America. In the 1950s and early 1960s, many Americans were enjoying a booming consumer economy, but a fifth of the nation struggled to put food on the table or to find adequate housing. In North Carolina the problem was even worse. Here, nearly 40 percent of the population lived in poverty. The Fund was also shaped by the experiences World War II veterans who had fought for democracy abroad. They had seen in Nazi Germany a reflection of the racism back home that violated American ideals of justice, freedom, and equality. Many of those veterans returned from the war determined to make the Jim Crow South a better place. When Terry Sanford campaigned to be elected governor, he promised to usher in a “New Day” in our state. The North Carolina Fund was his way of making good on that pledge. In 1964, the Fund made grants to eleven community-based antipoverty projects – three in the mountains, four in the Piedmont, and four down east. To kick-start those projects, the Fund also recruited student antipoverty workers, black and white, from colleges and universities across the state. They were known as the North Carolina Volunteers. These young people lived and worked together in racially integrated teams. During the summers of 1964 and 1965, they traveled to the communities the Fund had targeted. There, they taught adults to read, tutored school children, repaired houses, built new parks, and helped families in need of food and clothing. Like the Fund, the Volunteers first tried to uplift poor people by teaching them how to work harder and live better lives. But as the Volunteers labored in poor communities, they began to realize that they misunderstood the problem. Poor people were not to blame for their condition. For black North Carolinians, poverty was the product of a Jim Crow society that denied them access to education and jobs. And for whites and black alike, poverty was part of a North Carolina economy built on low wages. The lesson was clear: uplift would not end poverty. As one student Volunteer explained, that task required instead a “radical strategy” to “stop the exploitation of the poor by the more economically well off.” For the North Carolina Fund, this changed everything. In late 1965, it began to shift course. The Fund now put an emphasis on organizing the poor people politically, getting them out to vote, and supporting their demands for fair treatment by government officials, landlords, and employers. 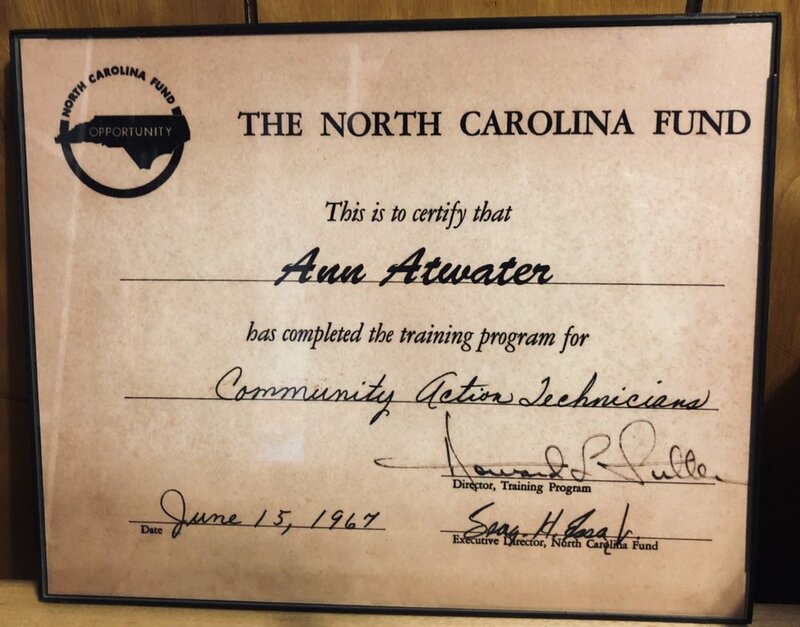 Certificate from Ann Atwater’s Community Action Training with the North Carolina Fund. This new approach ignited a firestorm of opposition. Local leaders in North Carolina had embraced the Fund because of the financial resources – including federal antipoverty funds – it brought to their communities. But they were not eager to give poor people a political voice. Nor did they intend to challenge what one of Governor Sanford’s advisers called the “poverty-segregation complex,” that tangled web of racial discrimination and low wages that impoverished both black and white North Carolinians. In northeastern North Carolina, where the Fund supported black sharecroppers who organized the People’s Program on Poverty, critics insisted that it was encouraging “heaped up, packed down and running over hatred of the white race.” And in the west, where the Fund attempted to establish a newspaper that would publicize the needs of the poor, critics denounced the project as un-American. They charged the Fund with promoting an Appalachian version of Pravda, the official newspaper of the Soviet Union’s Communist Party. Similar opposition in communities across the state brought the work of the North Carolina Fund to an end in 1968. The Fund did not win a victory over poverty, but the community organizations it established continued to partner with the federal government to push the poverty rate steadily downward, from 40 percent in 1960 to 12 percent by the 1990s. The Fund also left a rich legacy in the hundreds of men and women it inspired to commit their lives to building a just and prosperous future for our state.